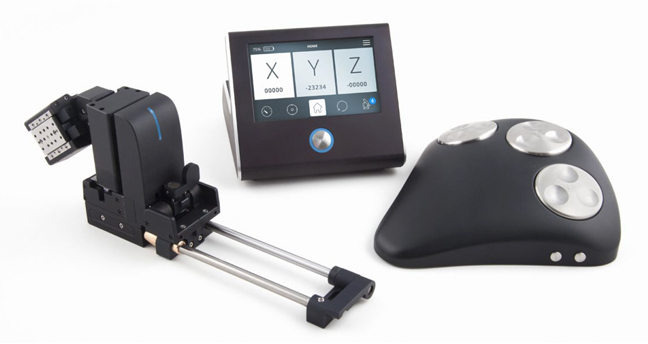 The new state of the art triple axis ultraprecise uM series of micromanipulators offer zero drift solid state drive with integrated closed loop controls to provide the most state of the art systems available today. The uM series is a compact plug-and-play system with unlimited scalability. With an impressive 20mm range with 5 nanometer resolution and 100 nanometer repeatability, the uM series also offers an easy to use electrode exchange mechanism for added versatilty. The Rotary Wheel Remote Interface is available in a four knob version for 4th virtual or physical axis. The remote interface offers quick buttons for speed and manipulator selections and a USB connector to Touch Screen Controller. The Touch Screen Controller is ergonomically designed with an intuitive user interface with touch screen display with an easy speed adjustment and manipulator selection. The controller offers programmable memory positions and millisecond level control synchrony between manipulators. Fast computer interface through Ethernet and open source SDK and development community are also standard features. For the most advanced micromanipulation system available – choose the uM series from Sensapex and Prior Scientific!